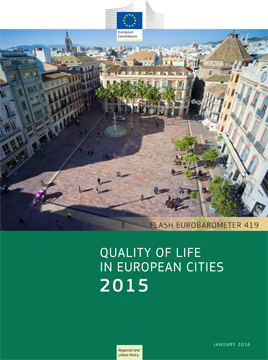 The European Commission has today released the results of the fifth Flash Eurobarometer survey on the “Perception of Quality of Life in European Cities”. The survey was conducted in a total of 79 European cities of all EU Member States as well as Iceland, Norway, Switzerland and Turkey. More than 40,000 people were interviewed on a range of urban issues. The survey exclusively focuses on quality of life, showing how satisfied people are with various aspects of urban life, such as employment opportunities, presence of foreigners, public transports and pollution in their cities. Among its main findings, the survey shows that overall Europeans are very satisfied with regard to the cities where they live: in all except 6 cities, at least 80% of respondents say they are satisfied to live in their city. Some findings show a positive trend compared to previous years: for example, in Budapest and Cracow, there has been an increase of 20% of those who have a positive perception of public transport in their cities, compared to 2012. The survey also reveals what areas deserve particular attention as a majority of people consider that health services, unemployment and education are the three most important issues for their city. The 2014-2020 Cohesion Policy will invest heavily in urban areas, with EUR 15 billion directly managed by city authorities for sustainable urban development. The Survey is designed to allow cities to compare themselves on 30 criteria addressing social, economic, cultural and environmental issues.. It should inspire stakeholders and decision-makers to follow a holistic approachto sustainable urban development.